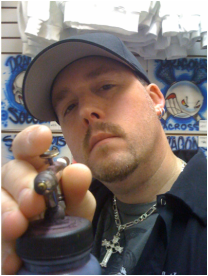 Owner/Artist Anthony Sesack has been airbrushing for just over 25 years. This all started as a childhood fascination. What I mean by that, is when I was around 8 - 10 years of age, growing up on Long Island's south shore, my family and I would attend the local county carnivals and street fairs. These events brought vendors from all over. The one that always caught my eye was the guy painting T-shirts. At that time, I didn't know that it was airbrushed. All I knew is that it looked so cool and that one day I wanted to do something like that. Who would have guessed that 10yrs later, I would take an introductory airbrush course in college. The rest is history. I never had any formal training. I had one semester of the Intro to Airbrushing 101, where we learned how to disassemble the airbrush, shading techniques, use of frisket, and painting on illustration board. This was all fine and dandy, but it wasn't showing me how to paint on shirts which is what drove me to learn more. About 1990/91, I transferred to L.I.U. from the two year SUNY college after earning my Associates Degree in Advertising Art & Design to receive my Bachelors in Graphic Design. While I was in attendance there, I was rummaging through the Art Department reference library. There I stumbled across a very old issue of Airbrush Action. I never knew this type of magazine existed. I tore out the subscription card and mailed it in. This opened up a whole new world for me. It almost seems like it was destiny that I found that magazine. As far back as a childhood fascination to making it a reality is just too surreal. With magazine in hand it was like I saw the light. Every book ever published, how-to techniques, training videos, etc. It was now all in my grasp. The first Airbrush Book I ever purchased for myself was "T-shirt Airbrushing" (Book 1) by Dale Boyd. I don't think any other book was published by this author. It was a great book to start out with. Teaching all the basic sills, drills and lettering techniques and even use of freehand shields. I think I own just about every book published as well as all the How-To videos by Terry Hill, Pat Reynolds, Kent Lind...the list goes on. Now that I have a few books, magazines, and an airbrush and some paint my quest continued. Between 1992-1994, I was just painting shirts and giving them away as gifts. I didn't feel the quality of my work was good enough to put a price on it. So, until I started to get the Ooohh's and Aaaahh's of amazement, I would continue to paint away for fun looking for those compliments all artist enjoy hearing. From my own perspective, I am my own worst critic. So it feels great when I look at something and think it's only "so-so" and you get someone else asking,"How much for that T-shirt?". As my work progressed, so did the income. Not like I was making millions, I made a few extra bucks here and there. It was more like play money. Go to the movies, out for a few beers with the fellas, etc. It wasn't nearly enough to make a living at it. In May of 1993, I graduated with my Bachelors Degree in Graphic Design, I was fortunate enough to work my friend's, dad's client. This guy had his own home operation out of his basement. It was primarily a two-man show (the owner and his brother), but the brother had other ideas so it was up to the owner to be the Account Manager and I would be the Designer. It was a start. I got my foot in the door, but it was for minimum wage which really "sucked wind" if you know what I mean. Working as a freelance Graphic Designer by day then the retail clothing store part-time, I barely had anytime to paint to either hone my skills more or even make a few extra bucks. Working two jobs for "peanuts" didn't help keep up my hobby. To coin a phrase as being a "Starving Artist" is true, considering the retail price of airbrushes, paints, and other supplies. Even when artists can get a break in price by buying from these specialty companies like Bear Air, Pacific Airbrush, Dixie Art, etc. you have to buy in large quantities to get any real deals. But at least these days we have the Internet and Ebay where you can buy and sell just about anything. I was fortunate enough to be able to purchase 15 used Vega 2000's, a 20 port manifold and hoses for $200.00. Retail price alone for 4-Vegas would run $200.00. Living on Long Island all my life you tend to see a lot of things come and go, especially in the local malls and fleamarkets. Since I can remember, there was always at least one airbrush artist in every location. Mainly in the fleamarkets because the rent was about half of what the full-scale malls were charging, but you could also have a steady income job and supplement your income on the side. That's if your day or night job fit your schedule. The fleamarkets around here are open on Thurs from 12pm - 9pm, Friday from 12pm - 9pm and then Saturday from 9am - 6pm and then Sunday 9am - 6pm. So if you had a job where you could set your own schedule, you were in like Flynn. One airbrush artist actually attended the same college I did for the first two years. One day I went to look for him and he was gone. Rumor had it that he packed his bags and went to Florida....the airbrush capital of the U.S.
Around 1995 I wrote a letter to the publishing company of "Making Money with Your Airbrush", author Joseph Sanchez. Within a month I got a phone call from Joe asking for me to send some samples of my work. I believe he was living in San Diego, CA at the time. I sent the samples and he called me a week later. He said I did great work, but my lettering was a little rough. He had called me initially because he had an opportunity to open a shop in the S.D. area, but unfortunately it fell through. Then he mentions that he has another possibility for a spot in Florida. I was all for it. I hadn't heard from Joe in about two months. I tried to contact him with the last known phone number and address I had, but the number had been disconnected and no further information was give. About 1996/97 I had the pleasure of meeting Terry Hill for the first time and even attended two-3hr courses that he was teaching. I met him at the Great American Art Event at Huntington Hilton here on Long Island. (For those of you who don't know Terry Hill, he is like the Bob Villa of Airbrushing). He is one of the most laid back people I have ever met. I enjoyed one of his on the job nightmares. He was working in a friends shop along side another artist, presumably a "newbie". This particular artist was having technical difficulties with his airbrush. He picked at the tip, back flushed it, etc. Terry continued to paint whatever design he was working on. The newbie attempted one more time of clearing his clog. He unscrewed the locknut, pulled back the needle......the next thing Terry knew was that he was getting blasted in the side of the head with red paint. I thought I was going to wet my pants hearing that story. The reason why the paint shot out of the front of the airbrush is because the blowhole in the top of the airbrush bottle was clogged which builds up air pressure inside the bottle. The paint only has one place to go, and that's out the front when the needle is pulled back. I had a similar situation myself. I was unemployed at the time around Feb/March of 1997. I was in my apartment testing myself on how fast I could paint these particular designs I was given. This was my first taste of production painting, but in the entertainment industry. The designs the "owner/artist" created sucked, but it's what he was using. So, I did the designs as accurate as I could and as fast as I could. I did each design in under 5 minutes. The owner was impressed so I got the job. It wasn't a bad start. I was making $55 an hour for a minimum of 3hrs, tops 5, maybe 6hrs at Barmitzvahs/Batmitzvahs, Sweet 16's and other events. I worked for him for a few years. He had a bad habit of letting his personal life interfere with his business. So, I would have to wait 2 weeks sometimes 2 mos to get paid. So, I ventured out into the entertainment business on my own and I have done quite well I must admit. In 1998 I had officially started my own business. I filed as East Coast Brush Works. The main reason why I had to file for a New York State business license is because I wanted to start working the street fairs like the other airbrush artists used to do. The Chambers of Commerce or Event Coordinators required a Tax ID# on all applications. So, I really had no choice but to file for a business license. With working such party events as I do almost every weekend, I also needed liability insurance or else the catering halls wouldn't allow me to operate in their establishment. You will see on my On-The-Road page several pictures of my traveling display. It has changed for the better of the past 4 years. Since 1998 I started out with a small 8' x 8' "Dome" EZUP canopy and a so-so display grid to a huge 10' x 10' "Eclipse" EZUP canopy with side-walls, 2500 Watt generator, HIX heat press, 10 Vega 2000 airbrushes, Sil-Air T-30 compressor, etc. I've done quite well and I still feel this is just the beginning even though I have been an official business since April 1998. I plan on owning a trailer one day instead of having to pack and unpack my truck four times a day. I want to be able to pull up and open for business. My setup takes me at least an hour to start my day and to close up at the end. I think the best investment I could have made was buying the Custom Car Transfer System last May 2001. This system designed by Tom Davison of West Coast Airbrush is a definite money maker. It's a large expense at first, but definitely worth it. I believe the full system is priced just over $400.00. I bought the system, arranged it in a file box and went on my way. My first Car Show I did I made over $400.00. Right there the system paid for itself. Although you won't have everone's car or you might have a customer say, "That's my car, but the rims are different....etc." That's when you offer him a picture of his car from a photograph supplied by him/her. Within the first year I only hit about 2-3 car shows because I was busy working parties. But within that short period of time, I made alot of contacts and even repeat customers that you run into at every show. I only hit the Long Island Car Show Circuit, but there's a car show just about every weekend which is great!! If I don't have a party for a week or even a month, I have the car shows to do. So I always have a little extra money coming in. My dream is to own my own shop, but the way things have been around here since 9/11, I don't know if leaving my steady job, weekly paycheck, medical benefits is worth the stress of possibly NOT being successful. Which happens to be my worst fear. November 15th 2002, Kim and I tied the knot at Windows on the Lake in Ronkonkoma, NY. She is now Mrs. Kimberly Ann Sesack. We spent our honeymoon on the sands of Cancun, Mexico. If you want an excellent vacation spot, you have to check out the Moon Palace of the Palace Resorts. It's a great place to relax and unwind. You will also gain about 10lbs from all the great food and a wide variety of frozen drinks to enjoy. In August 14th 2003, Kim and I would like to announce the birth of our first child, Anthony John Sesack, Born: August 14th 2003 at 12:14am. In March of 2005, I opened a retail location on Long Island, in the Tri County Flea Market (3041 Hempstead Tpke. Levittown, NY), which is now known as the Tri County Unique Bazaar. I have been at this location for just over 10 years now. I also travel throughout the Tri State area working Bar/Bat Mitzvah events, Sweet 16's, Communions, Block Parties and I attend the local Arts & Crafts Events and Sporting Events during the Spring & Summer months. In January 8th 2008, Kim and I welcomed a new addition to our family. Sean Thomas Sesack, Born: January 8th at 6:15pm. February 2014 A.J. completed the requirements to earn his Arrow Of Light award. It is the highest award a Cub Scout can earn. On this same day A.J. crossed over and joined Troop 175. Update: In Oct 2015, A.J. earned his Second Class rank. He now has 12 Merit Badges to his credit and has been to sleep away Scout Camp for two summers now. Sept 2014, my youngest Sean joined Cub Scouts as a Tiger Cub. He's such the little go-getter, but he's also a handful. I have to tell him to "sit down" more than any other scout. Latest update: On Oct 25th, 2015, my oldest son A.J. earned his his blackbelt in Kempo Martial Arts. 7 years and 10 belts later he finally achieved his goal. Other schools are what might be considered a "black belt factory". Where a student is taking a karate class for 2 years and is now a "black belt". Kempo Martial Arts is one of the best schools I have ever experienced. January 8th, 2016... HAPPY BIRTHDAY SEAN!!! You're such a handful! !